Weather – That time of year. High sunny 90’s during the day with high humidity. Nights a comfortable 75. But on and off-tropical showers during the week. More expected this week with occasional thunder and lightning storms. Water – Blue and mostly flat as long as the winds don’t blow at the beginning or end of a little rain squall. Surface temps 85 degrees. Fishing – Most folks caught more and bigger fish than they ever have in their lives. Many caught so many fish early in their vacation or early in the day that they had to slow it down a bit or they would have too much fish. Lots of fish released. Tuna between 10 and 60 pounds. Big roosters. Dorado between 10 and 25 pounds. Billfish showing. 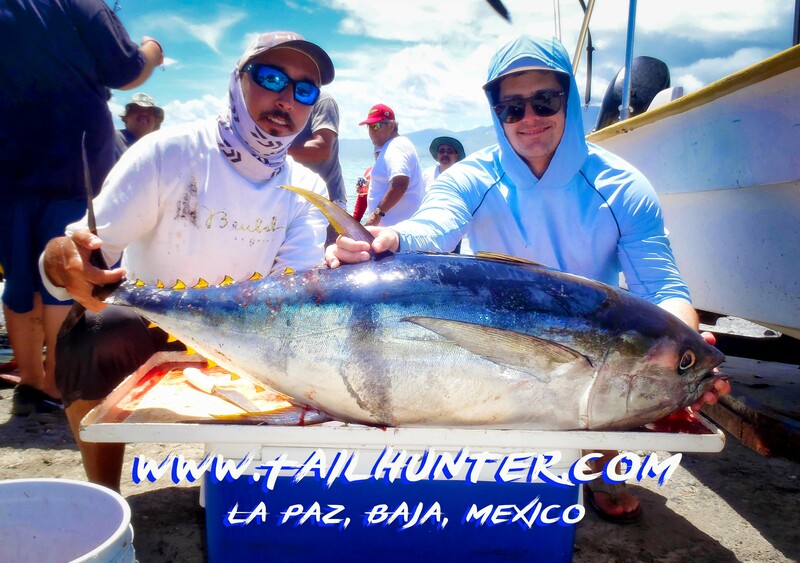 Best tuna fishing Las Arenas/ Muertos. 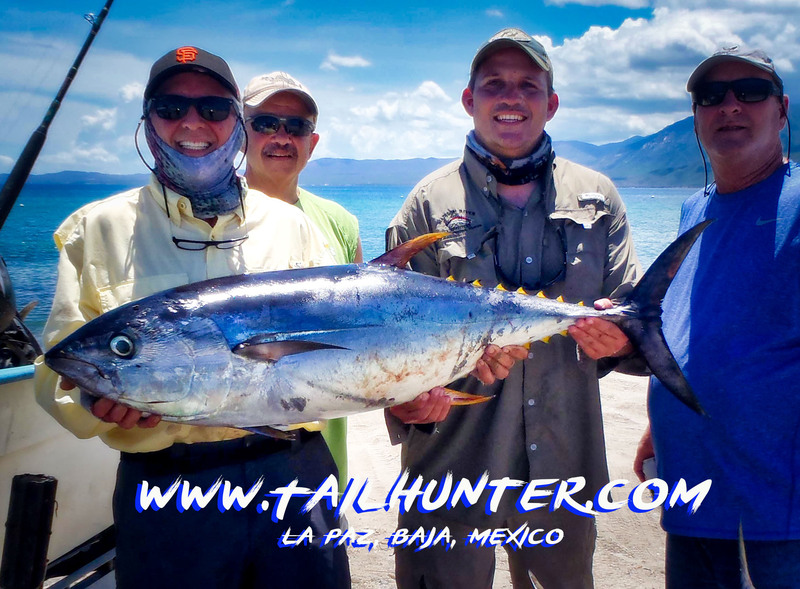 Best dorado fishing is around La Paz. 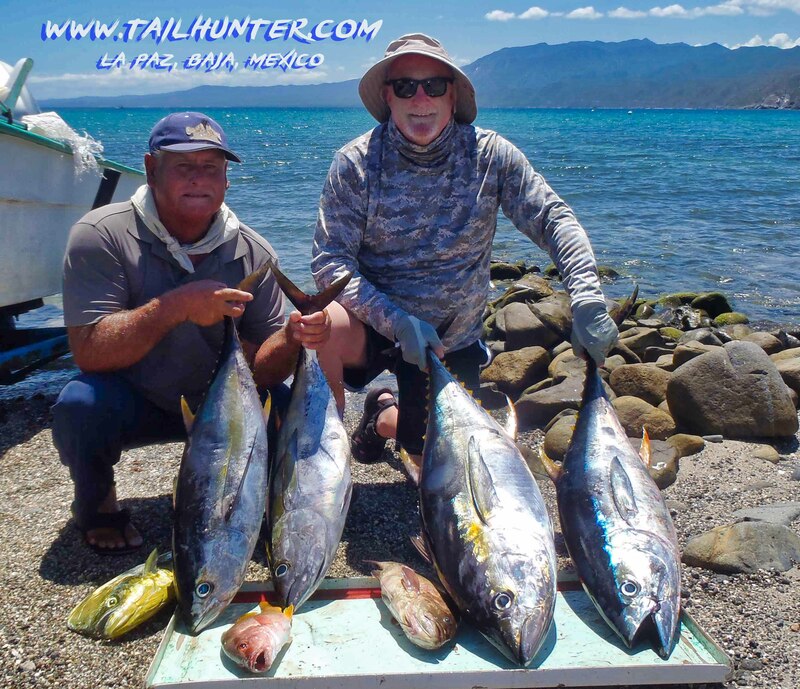 Catching – We lost some marlin this week as well as some of the larger dorado and ALOT of the big tuna that were estimated between 50 and 100 pounds. That’s a pig! Thick and fat! Daniel Bovee of San Diego has an understandable grin after landing his biggest tuna. Captain Pancho estimated it in the 80-pound-class! 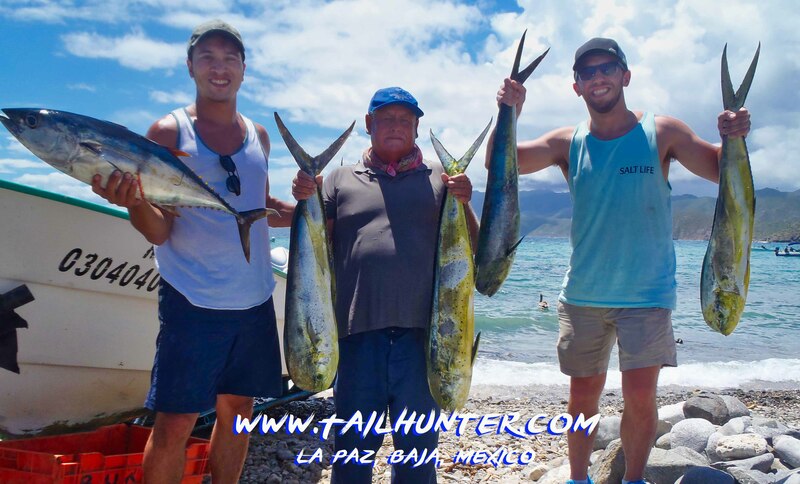 Two of the funnest and funniest guys this week, Joaquim Perea and Rick Rumzy were visiting us for the first time and got a double hook-up on roosters! The squirming fish are kinda hard to hold onto for photos! But, both fish were released and swam off strongly. The guys are from Woodland CA. Whoa! 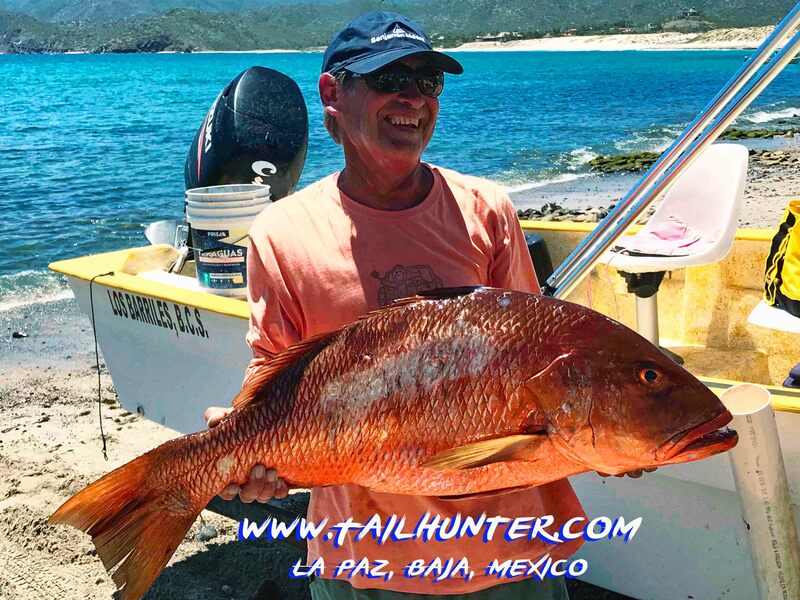 We don’t see to many of these this time of year and you need TNT and a crane to get them outta the rocks, but Greg Saubolle said this “was on my bucket list for years” when he stuck this 30-pound-class dog tooth (cubera) snapper. 1…2…3…SMILE! 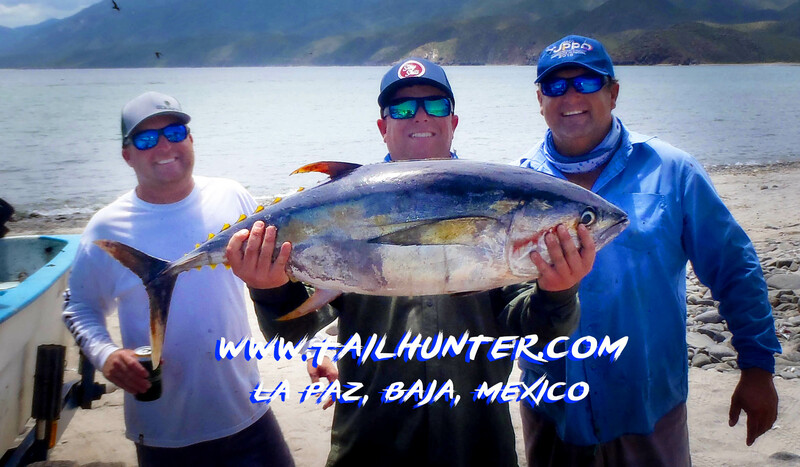 Captain Jorge helps out Greg Saubolle and Len Weaverling with a day’s catch of yellowfin tuna! 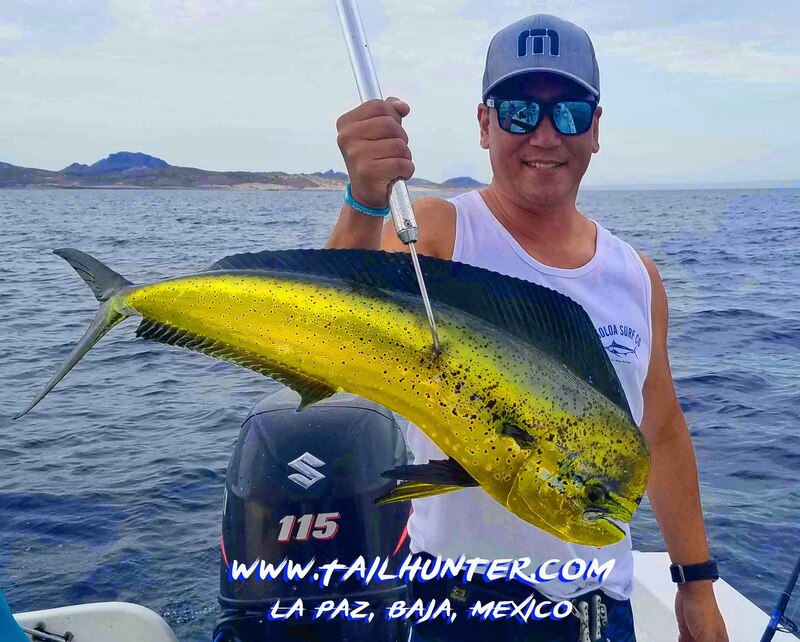 Colorful dorado for Ray Cabales who caught this mahi north of La Paz. Pretty fish! Know when-to-say-when! 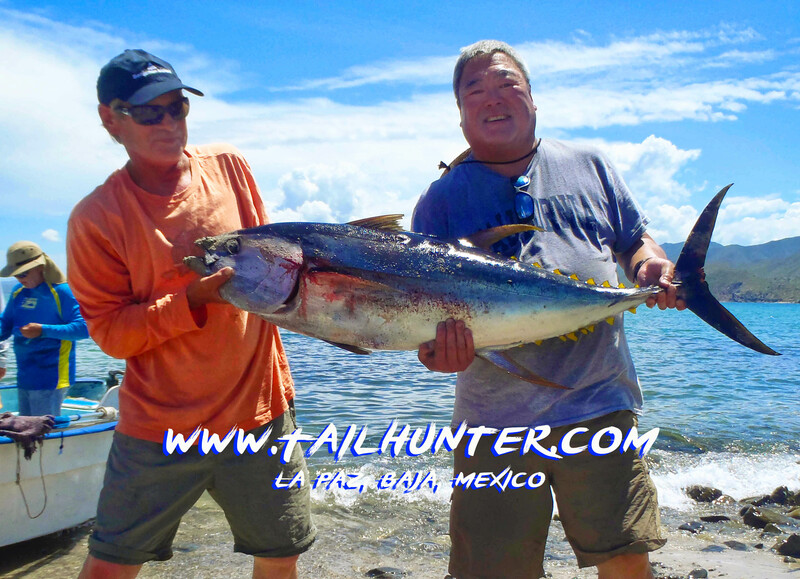 Our great amigo, Paul Nagata from San Francisco has fished with us for years and has pulled on some big fish but after over an hour on this fish that weighed 56-pounds (he had a scale) on light tackle, he knew when to hand the rod off for the last few minutes of the fight and boated a beautiful tuna! The guys brought the huge collar (weighed about 10 pounds!) to have us grill it up at Tailhunter Restaurant for 4 guys! 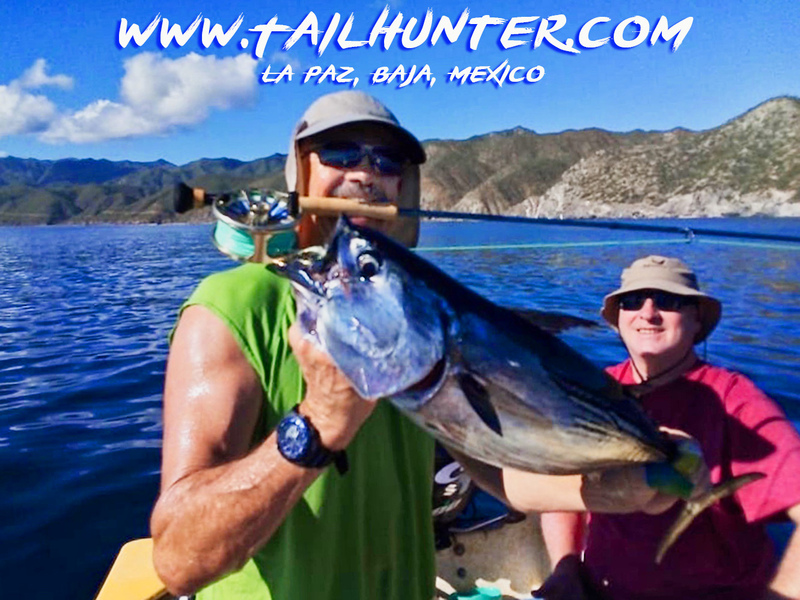 From Arizona, Mike Hudson finally made it down to us and posted a great first day with Captain Arcangel with tuna, dorado and pargo! 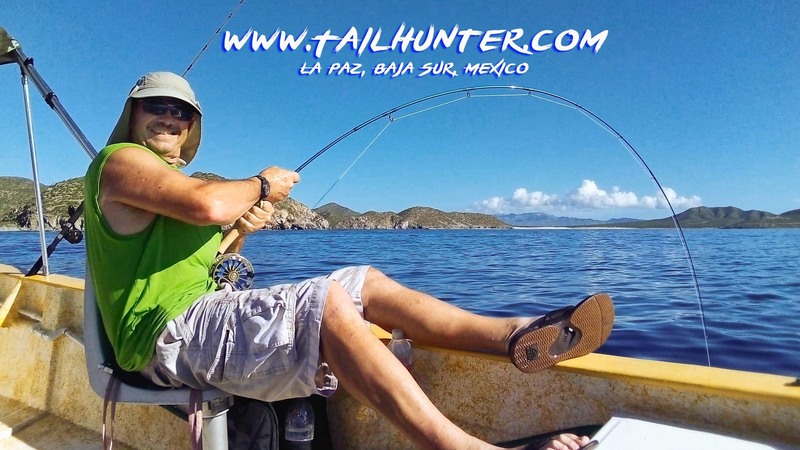 When you’re tired of catching tuna, do something else! Burke Winnie with his firs rooster! Released! Elija Gilbert really really really wanted a marlin! 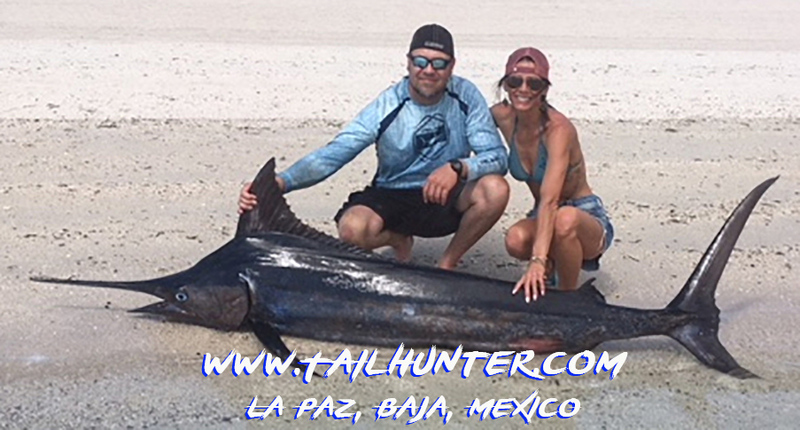 So we teamed him with our Captain Chito and at the last minute…this 200 pound blue marlin. He’s on the beach with Shaina Clayburn also from Utah! Our favorite Atlanta guys! Leif Dover and Brian O’Neill have fished with us often for years and always do well. They caught so many tuna the first few days, they chased other species or donated their fish! This is my favorite photo of the week. It’s called “My happy place!” Joaquim Perea on his flyrod getting bent and having a blast. Our Stockton CA contingency for the week, Vito Cipponeri and James Giovannoni hauled back a mound of fish after 3 days. Now THIS is a tuna! 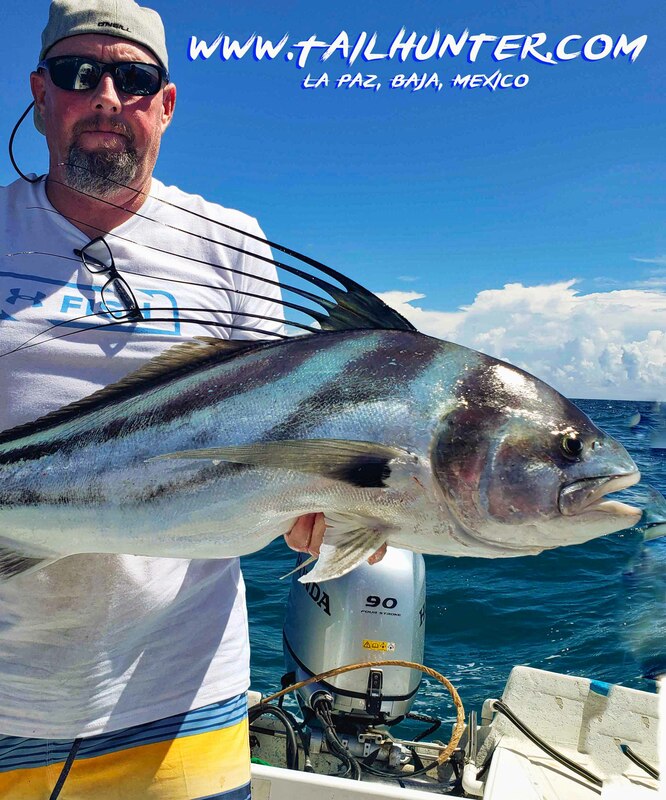 John Bertwistle from Woodland CA hooked this powertrain tuna and hung on! First rooster for Joaquim Perea. A quick photo then back in the water! Gorgeous colors! Just a great photo! That’s alot of sashime after one day. 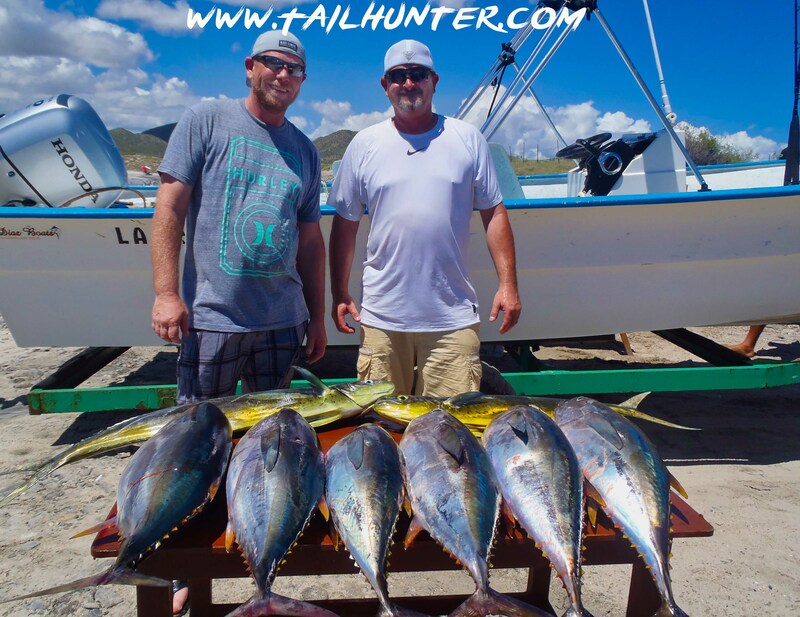 Greg Saubolle was with Len Weaverling and hung a few yellowfin! 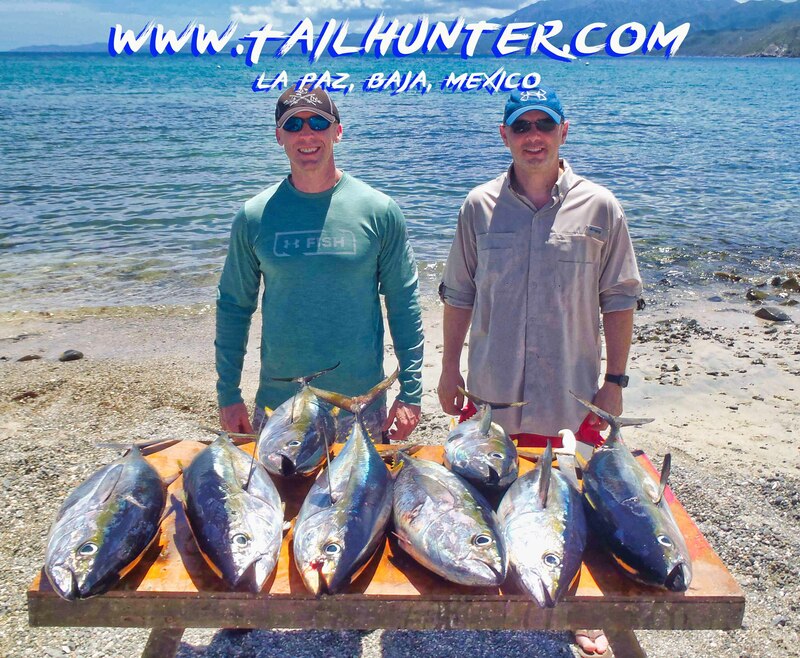 Captain Armando and Austin Reay check out Taylor’s slug yellowfin tuna! He only had one day to fish but did well! 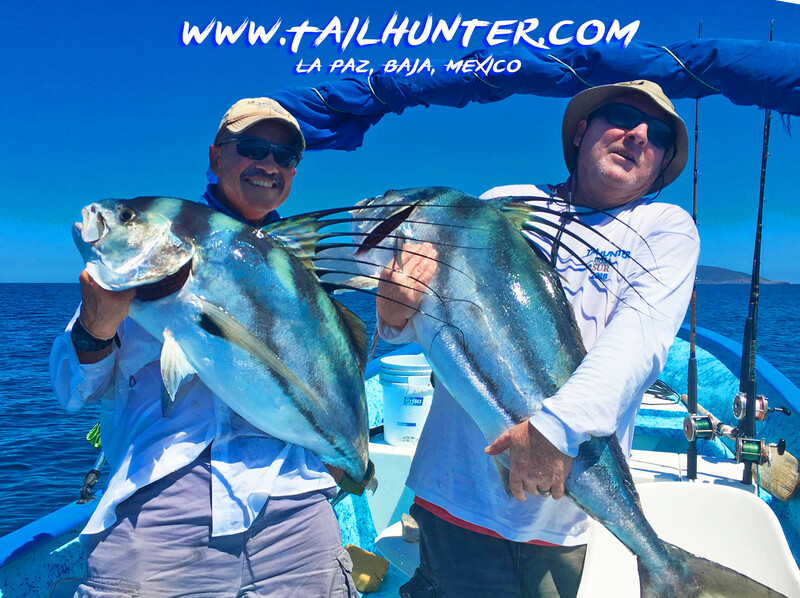 All the way from Illinois, Pat Ellis and Clayton Demanes with Captain Arcangel had one day to squeeze in some fishing and got a couple handfuls of dorado and tuna! 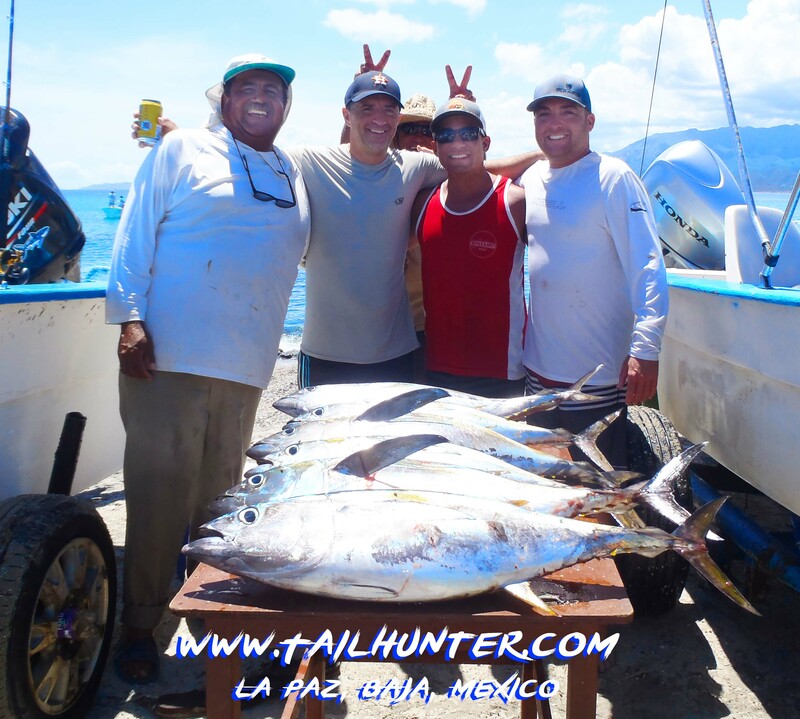 Hard to tell who’s photo-bombing Captain Victor, but Mike, Dave and Austin had a pretty good day on the yellowfin. 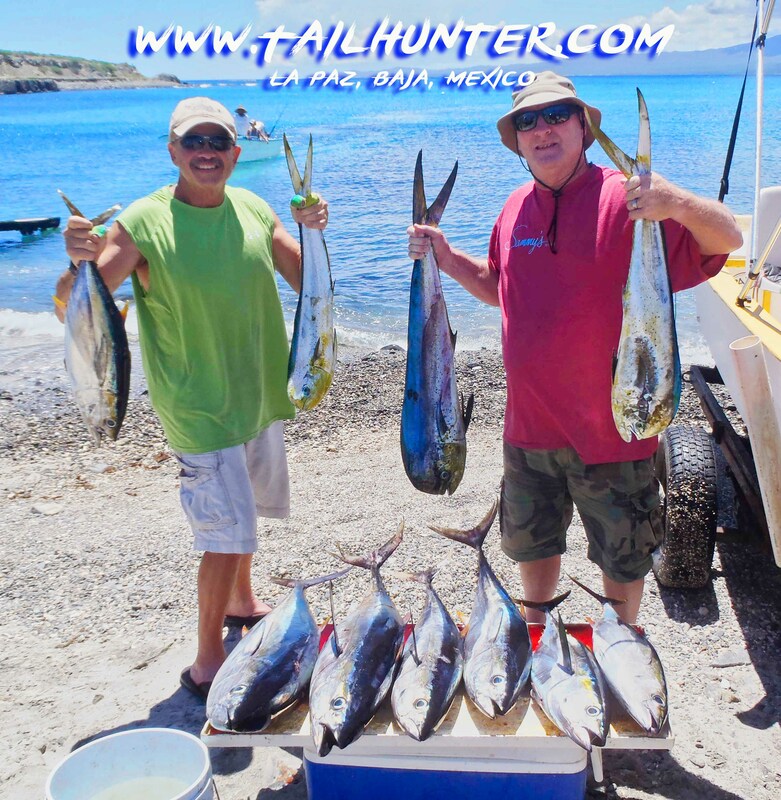 Good start for Rick Rumzy and Joachim Perea with a full box of tuna and dorado. Joaquim found out how tough our bonito are on a flyrod! 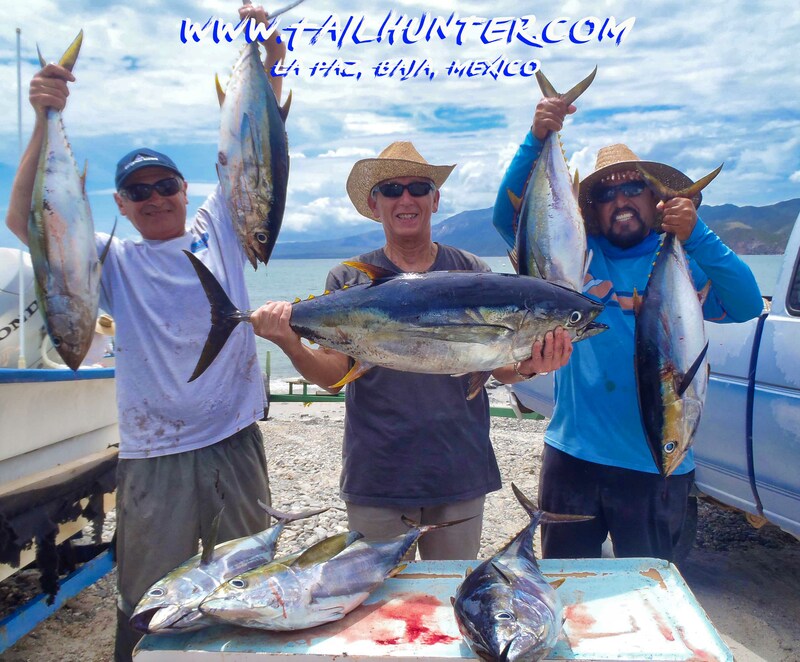 Despite some winds and afternoon thundershowers during the week another great week of fishing down here especially for the tuna off Bahia de Los Muertos and Las Arenas. 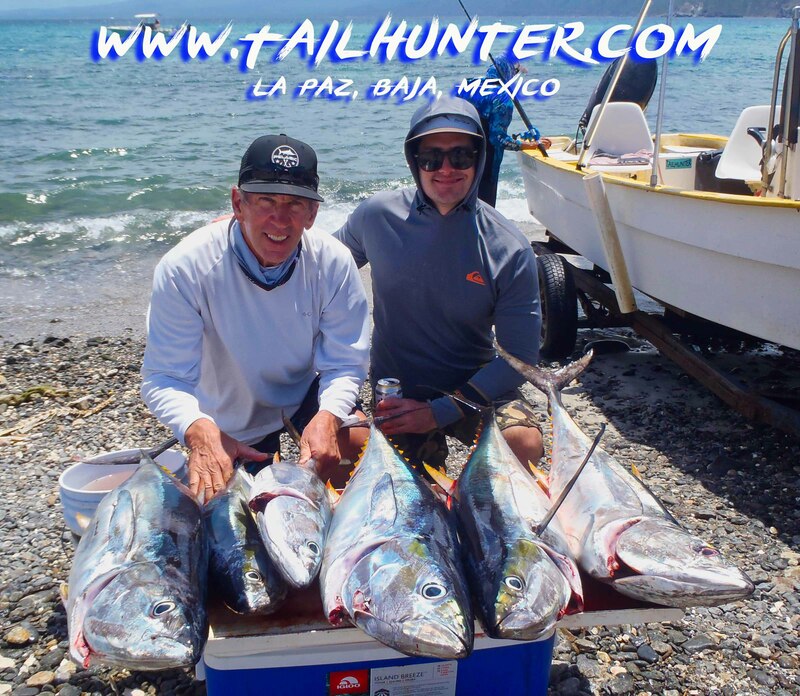 Just like the previous week, there were some days when the tuna bit early and hard and there were so many tuna that anglers either quit and returned to the beach early or they went off looknig for other species. 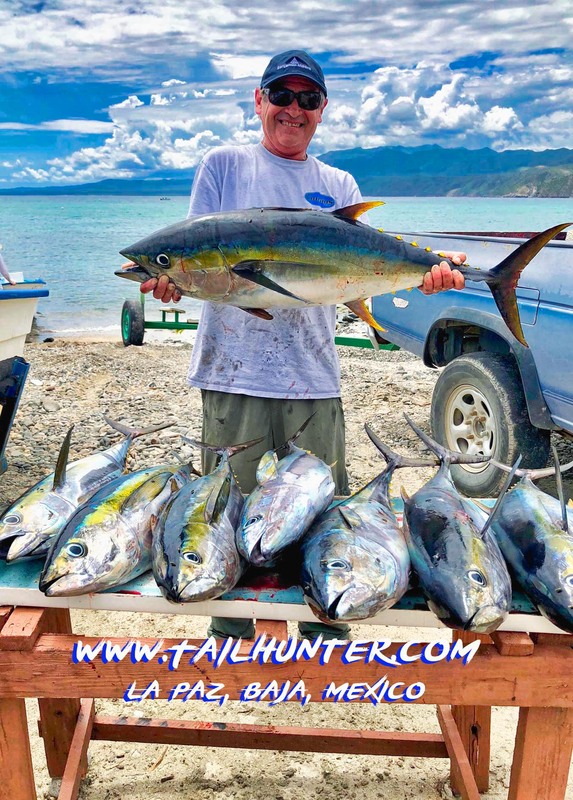 The tuna ran the gamut from little 5-pounders up to about 50 or 60 pounds with several larger fish up to 80-pounds that were beasts on the live bait and light tackle. Several fish up to 100 pounds were lost at color! Most folks had as much fish as they wanted and caught and released many fish or donated the meat. They went searching for other species! We also got into jack crevalle, some nice dog-tooth snapper, pargo liso, cabrilla and pompano as well. But the biggest surprise were the roosterfish! Like the week before we caught more roosterfish this week and last week than the rest of the week combined! 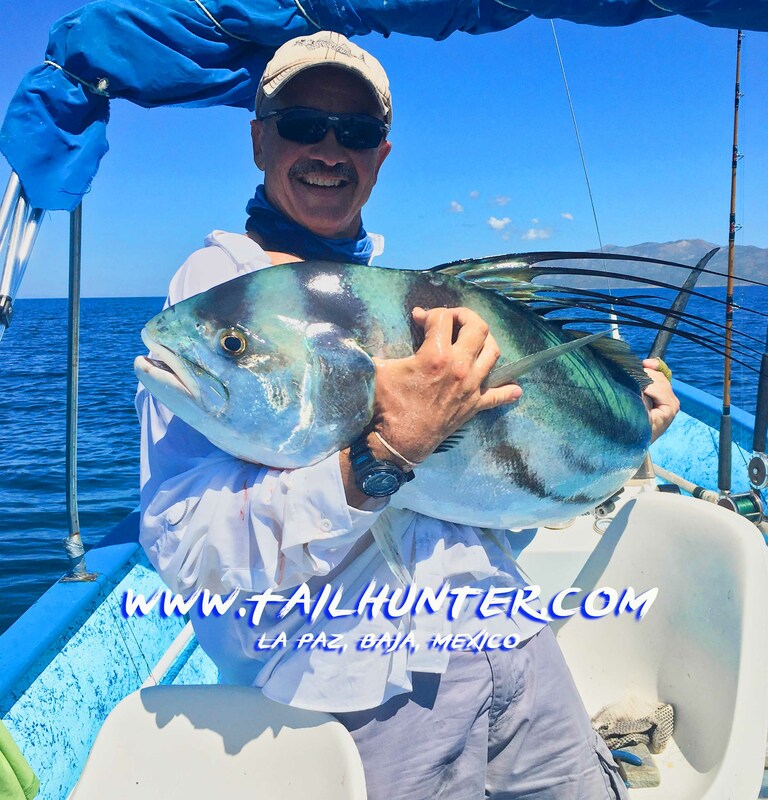 There were a few days when we hooked and released at least a half-dozen gallos all ranging from 25-60 pounds! The upcoming week shows signs of itermitent rain showers and scattered thunderstorms again, but not much wind so hopefully, it shouldn’t affect the fishing too badly. Most of the rain has been in the afternoons. In between the rain, it’s hot and sunny! Looks like a postcard!